The secrecy surrounding the death penalty in Japan is an egregious encroachment of basic human rights. Even proponents of the death penalty should support reform. Imagine you sit on death row. You live in an isolated cell, where you are forbidden to speak to other inmates. The cell is frigid in the winter and boiling in the summer. Bright lights are kept on in your cell all day and night, making it impossible to sleep. The visits from your family and lawyer are supervised and irregular; friends are not allowed to see you. Any moment and without warning, you can be taken from your cell and told you will be executed, usually within a few short hours. There will be no explanation as to why the Justice Ministry has decided to go ahead with your execution while others still wait on death row. You will not be able to contact your family or your lawyer. There isn’t even time for a last meal. You will be executed in secret, by hanging. Even the location of the execution site is unknown to the public. Your family and lawyer will only be informed a few days after the execution has taken place, so that they can collect your body. Sound like the makings of a dystopian science-fiction novel? Unfortunately, you’ll be sad to learn that it’s actually the execution system of modern day Japan. The death penalty in Japan is an institution shrouded in secrecy and brutality. Executions are done in secret, the conditions are unforgiving, and conviction rates defy both statistics and logic. There is no public accountability. The death penalty in Japan is a severe infringement of the basic rights of its citizens and a call for transparency must be demanded. As one of the most affluent and influential world democracies, Japan’s current lack of transparency regarding the death penalty is alarming, even for those who may believe that capital punishment is justified. One need only look to this year’s executions to see how Japan’s death penalty process blatantly disregards natural human rights. What little we know about death row comes from the few inmates who have experienced it, such as Masao Akahori, who was exonerated and released after being imprisoned for 31 years due to a false confession he made after being beaten by police in 1954. Of death row, Akahori describes living in constant fear of execution, having even once been taken out of his cell for execution, only to be returned after the guards realized the execution order was for the prisoner in the adjacent cell. On death row, prisoners are also forbidden to speak to one another and live in constant isolation within the small confinements of their cell, with only sporadic, supervised visits from their lawyers or family members, and two brief exercise breaks a week. The conditions of death row inmates’ cells are similarly bleak: inmate Masashi Daidoji, who still sits on death row, describes the cells as being unbearably hot in summer and freezing in winter in his prison diary. Daidoji writes how bright lights are kept on 24 hours a day and inmates are not allowed sleep masks for fear they might use them to make a cord to commit suicide. Inmates are also not allowed television and can listen to the radio, but cannot choose the station they listen to as to prevent them “from getting unnecessary information or stimulation from the outside world.” Printed material is often censored before it reaches inmates and the names of inmates that have been executed will be blacked out in newspapers before being given to prisoners still living on death row. If prisoners have complaints, they can make them to a Justice Ministry representative, but a representative is only legally obligated to visit the prison every two years. Because inmates only have a few short hours before they are hanged after learning of their impending execution, they cannot choose their last meals. During the execution, the only witnesses are the officials and the guards, as no one else is permitted in the execution chamber. Even Japanese legislators have a difficult time seeing the conditions of both death row and the execution chamber, with nine legislators fighting and winning the right to see the execution chamber in 2003. Before that, the last time a Japanese legislator had been granted the right to see the execution chamber was in 1973. In 2010, Japanese media was at last granted the right to view an execution chamber, but foreign media was excluded. Even then, journalists were taken to the execution site on a bus with closed curtains, so that the location of the execution chamber remained a secret. While the Japanese government contends that the reason for the secrecy comes from a desire to protect the privacy of the prisoners, opponents insist that this lack of transparency is in place in order to prevent the media hoopla that comes from those who dispute the case or have disapprove of the death penalty, as often seen with executions in the United States. More troubling to opponents is that Japan has a 99% conviction rate, with most convictions being based on confessions. Some critics attribute this nearly perfect conviction rate to forced confessions, which would mean that there is a strong possibility that many of the inmates currently on death row could be innocent. 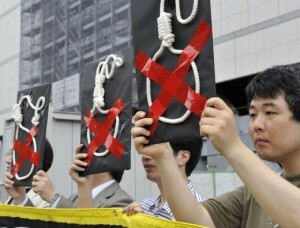 But, while Japan’s bar associations and several rights groups, such as Amnesty International’s branch in Japan, have condemned the hangings and Japan’s use of capital punishment in general, about 80% of Japanese citizens support the death penalty, making it an uphill battle for those who oppose it. Abolishing the death penalty in a country where the majority of citizens are in favor of it may seem like a difficult, daunting, near impossible task for activists who strongly contest it on the principle of the right to life. The United Nations has already passed a resolution calling for a moratorium on the death penalty in all countries in December 2012, one that the Japanese government essentially ignored with the latest executions, which took place only a few months after the resolution was passed. However, despite the strong support for the death penalty by both the Japanese citizens and its government, rights groups can still call for the government to at least reform its death penalty policies and allow for transparency. Conditions for death row inmates need to be improved. Prisoners on death row should be given adequate notice of the date of their execution and their family members and lawyer should be notified of the proceedings before the execution takes place. More importantly, Japanese legislators, the Japanese media, and the Japanese public have the right to know more about both the conditions of death row and of the execution chambers, including where the execution sites are located. The Japanese public should be notified about executions beforehand, allowing them to exercise their right to peacefully protest the proceedings if they so choose. The method of execution should also be more humane, giving inmates the option of lethal injection over the brutal method of hanging. Japan, as one of the leading democracies of the world, must adopt a new death penalty policy rather than keep the authoritarian system that is currently in place. Only when Japan’s death penalty policy becomes humane and transparent can it begin to have any sort of place within a civilized democracy. As of now, Japan’s secrecy and treatment of the death penalty is an ugly blemish on an otherwise democratic, principled nation. Laura Giunta has a Master’s degree from St. John’s University. She is a children’s librarian residing in New York State. NB: DPN does not support some of the conclusions of this otherwise remarkable article, and specifically that “Only when Japan’s death penalty policy becomes humane and transparent can it begin to have any sort of place within a civilized democracy.” DPN believes that Japan will “begin to have any sort of place within a civilized democracy” when it has implemented a moratorium on executions and initiated the legislative process ultimately leading to the unconditional repeal of the death penalty. I am actually against the death penalty, too, so I personally agree with the revisions. When I originally wrote this article, I was trying to find a common ground between both those who supported and those who were against the death penalty because I wanted to spread awareness of the unjust system Japan currently has in place, something I think both sides can agree is terrible. Moreover, I didn’t want to alienate those who are for the death penalty, who could have potentially dismissed the article entirely without encouraging at least reform in Japan, which is desperately needed. I think, in Japan’s case, when such a large percentage of the population is for the death penalty, its better to focus on small reforms first than outright trying to abolish the death penalty in the country, and hopefully each smaller reform will lead to eventually making it easier to get rid of capital punishment entirely. For example, if there was less secrecy in Japan regarding the death penalty, those who are against it would be better able to protest executions before they happen and the public would get to see a human face before the execution is carried out, which might then help to sway the general view of the population toward abolishing the death penalty. However, thanks so much for sharing on your website and Facebook page. I think, because Japan is a civilized democracy, most people don’t know or expect Japan to have such a dystopian execution system (I didn’t know, and so when I found out, I immediately wrote this article), so I am glad that you are able to spread more awareness about the issue! DPN believes that the death penalty is inherently cruel and barbaric, and that the notion of a “humane” form of capital punishment is a misconception that can only serve to perpetuate an anachronistic punishment.